The tip pipe goes straight to a tank without joint part. No air leaking and keeps suction maximum. Big tip capacity, big heat capacity. 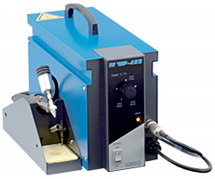 The heater is turned ON automatically when sucking to keep tip temperature continue for Pb free desoldering. Built in CA sensor in the solder tip. 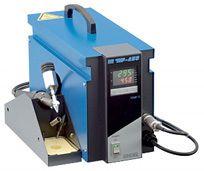 The solder tip temperature is controlled with high response feed back zero cross SSR PID thermo controller to keep the solder tip temperature continue. Easy to clean up the solder tank and change the filter. Just only remove a cap. No solder sticking special stainless steel cartridge filter. Temperature feed back under load by builting in CA sensor in the solder tip and digital display. 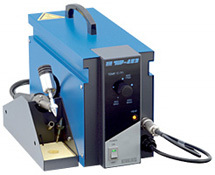 Equipped a zero cross SSR control noiseless vacuum pump and high response vacuum generator (700mmHg)type Top-453. Equipped 80 watts ceramic, heater drives at 24 volt. High isolate resistance makes good effect for high density LSI, etc. to protect from destruction of IC. Our catalog will be promptly sent on your Request. Copyright © 2014 TECHNO DESIGN INDUSTRY CO.,LTD. All Rights Reserved.